The base distribution includes around 250 essential packages, many useful libraries, applications and window managers. It is a good place to start if you are not really sure what you need. There are also many possibilities through CD-R, DVD-R and pre-installed hard drives available at the store. This is the best option for complete setups and for dial-up connections. The distribution consists of the GNU-Darwin package manager plus 250 packages: applications, libraries and utilities. A very interresting offer on CD-R which installs the base distribution and many other interresting packages, a total of 187 packages including the Gimp, OpenOffice and Mozilla which are not included in the base distribution because of the hudge download size involved. You may also want to look at the downloads page which tracks interresting new packages releases. and you can also look in /var/db/pkg which contains the database of all installed packages. 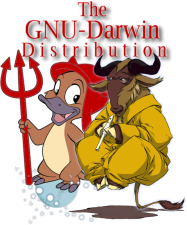 Donate: If you appreciate the work that GNU-Darwin is doing, then please consider contributing to the Distribution. Everyone can help.